If you are new to this blog, you may want to start reading from the first post and work your way up chronologically by clicking on "newer post" at the bottom of each page. If not, feel free to read the story backwards! Over and above his and Julia's already generous hospitality, John has offered to drive me out to St Johnsville to where I left my car. We get up early in the morning so that he can make it back to work at a reasonable time. It is a pleasant drive and I get to see some of the places I went through from a different perspective. John is a great guy and I hope he gets to do his dream of riding a bike across the USA soon. Not too far off course is the little hamlet nestled in the Adirondacks where, on that frigid day last January, the wheels were set in motion for this adventure. I feel a strong urge to pay a visit just to put a feather on the cap of this journey. So off I go into the winding roads until I get to the same store that was so quiet in the winter but now is animated with busy summer traffic. Instead of knee deep snow there is ankle high grass, the Moose River is liquid, languidly flowing through the green valley. In the rack where I found Cruise-eau sits another boat, waiting for someone else's adventure. I find one of the salesmen who sold the kayak to me, and I ask him if he remembers me. After pondering a bit he says, "Oh yeah, you wanted to do that thing with a bike. How did it work out?" The trip started with wings and needs to end with wings, and this bar that looks like an airplane crashed into it seems like an interesting enough place to find them. It is! Not in a particular hurry to get home, I shun the interstate and take the scenic back roads that wind through the Black River valley, which was once the route of a feeder canal that brought goods to and from the north central part of the state via the Erie Canal. Its locks now lie in ruins along the the length of this road. 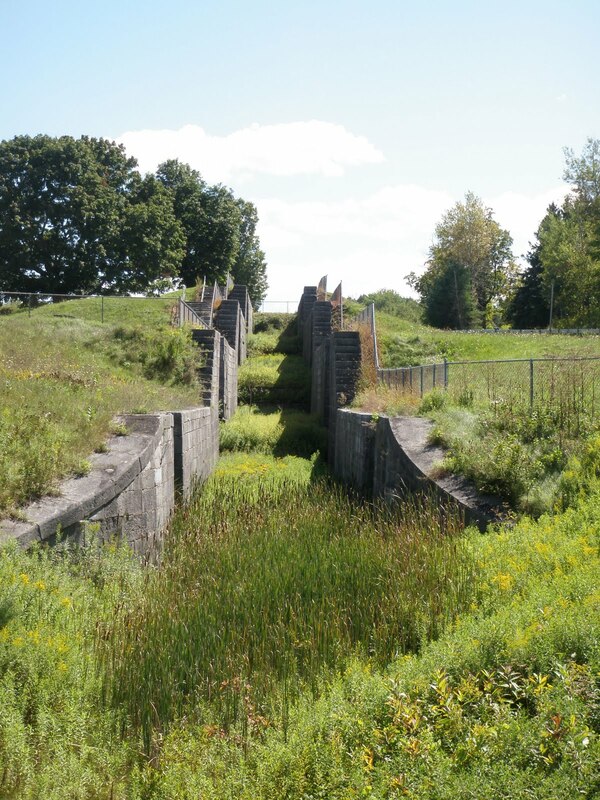 Had the canal building era not ended so abruptly, the Black River Canal could have gone all the way to Ogdensburg! Over the bridge and into the border, there is no line up to enter the True North this time. I pull up to the booth and the customs officer asks me if I am bringing anything back into Canada and if so, its total value. I tell her the token dollar amount of the odds and ends I got along the way. I could have said, "Memories, lots of great memories, and they're priceless." It is nice to see a sunny sky in the morning again after too many grey or rainy days. I come down from my third floor room to find the boat and bike still happily sitting by the front door. I tell the new woman in the front desk not to worry because I'll be moving my weird belongings away from the entrance soon. She laughs. I eat a leisurely breakfast before setting off to cross the bridge, not looking forward to those tight turns again. I go into Lock 10 and ask the lock master, Joe, about the situation and it looks like the canal will not be operational until the weekend. I guess I will not get to go on the famous Waterford flight of locks. I will have to come back some other time. Joe was nice enough to offer me a cold bottle of Gatorade from his fridge, and he showed me picture of the severe damage a really bad flood in 2006 caused. All the buildings had to be completely rebuilt. The signage for the Canal Bike Route falls apart in Schenectady and I get lost and find myself in the midst of mid-day traffic in the centre of town. It's a good thing I have the GPS, I get off the main street, find some quiet residential side streets and deduce a way through town until I reconnect with the path. 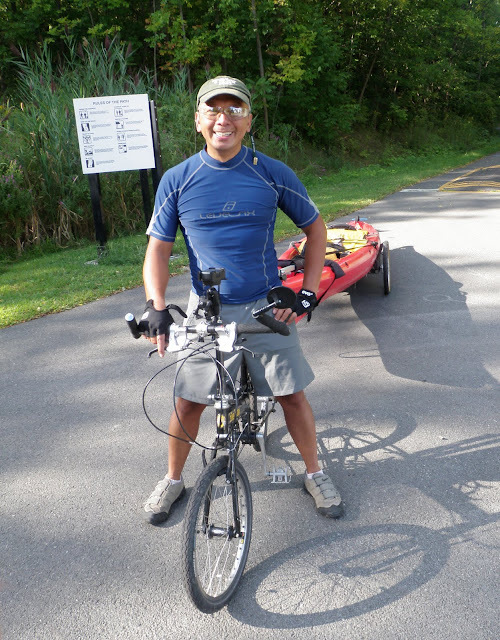 Not paddling on the canal meant towing the kayak up a very long steep hill over the bluffs that overlook the Hudson Valley. The views are fantastic, and make the hard work somewhat worth it. On the pathway, a cyclist going the opposite way sees me and shouts "You stole my idea!" He soon turns around, chases me down and asks me about the rig. On the descent into the Hudson Valley, the bike path suddenly ends and I am back to dealing with city streets again, this time busy with the afternoon rush hour. The signage is really bad and I make a couple of wrong turns. Eventually I get to the Hudson River shore at Watervliet. Hanging out by the rocks are a bunch of guys "fishing" with Budweisers. I ask them how far it is to downtown Albany and they tell me it 6 or so miles which would still make a good paddle to end the day and the trip. They have a kick witnessing the conversion of the rig and we were cracking jokes back and forth. "Am I going to get mugged by the fish in the Hudson?" The Hudson is at sea level all the way to Albany, more than 150 miles inland from coastal New York City. Tides become a factor when paddling as the ebb and flow of the water can cause odd things to happen. Luckily it is close to the high tide and the water seems quite calm. It is littered with debris, however, most likely the stuff I saw falling in from the Mohawk. Still it is so nice to be on the water. I slip under some impressive looking tall bridges, streams of trucks and cars high overhead. The steep bluffs are heavily wooded and for a while it is hard to sense the state capital is nearby. 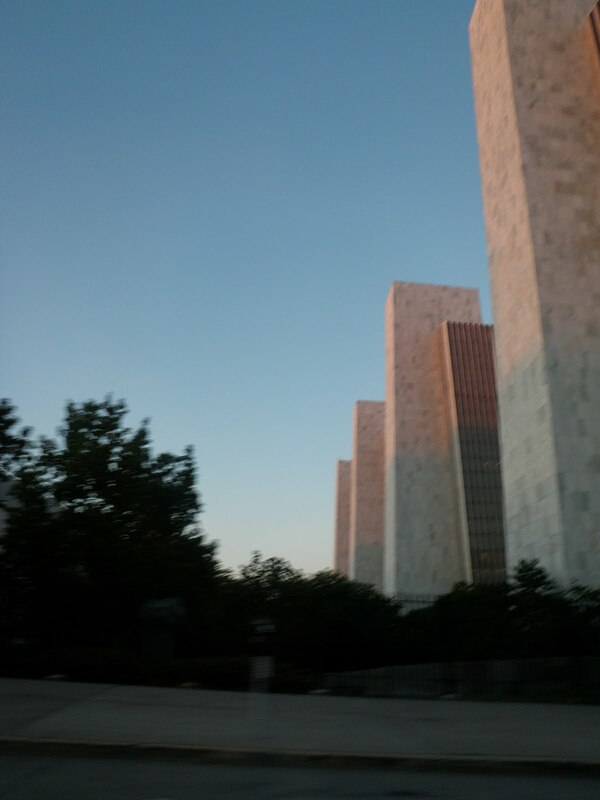 Soon enough Albany's towers appear, glowing in the light of the setting sun which is also casting shadows onto the water. I slide into a public boat ramp near a rowing club, which I find out later is actually where the old Erie Canal used to terminate. As I'm pulling the boat out, a man on a bike comes over to chat. John was waiting for his wife to come back from jogging along the river path. He immediately detects I'm from Canada when I start talking to him, telling him about my trip and that I am just finishing it right here, right now. He invites me to stay at their house, saying his wife Julia would not object. What an amazing stroke of seredipity! Julia comes bounding down the pathway with a smile, and we pile all my stuff and tie the boat on top of their station wagon to their beautiful home in Albany's southwestern suburbs. After a hot shower I sit down with them to an amazing five-dish dinner that Julia whipped up seemingly without effort with her magic pinky finger just like my mom. We talk about everything and anything, never running out of things to say until we decide it was time for sleep. To Julia and John, my deepest heartfelt gratitude, I could not have wished for a better end to my trip, way better than a fanfare of trumpets. It is moments like this while travelling that reaffirms my faith in humanity, that most of us basically prefer to be kind to each other. I feel like a lucky kid at Christmas, and I can't even escape the coincidence that I reached my destination with my "mule", end up in a little town called Bethlehem NY and find a room. That room is their 17-year old son's, who is away visiting his uncle. I can't believe my lucky stars and I fall asleep as I stare up at a ceiling with little glow-in-the-dark stickers of planets and spaceships that have probably been there since Ethan was a little boy. I get the bad news early in the morning. Bernie says things are worse than everyone thought and the canal will remain closed, possibly into the weekend. I am peeved as I am missing out on one of the most scenic parts of the waterway. Somehow I am determined to do a bit of paddling today no matter what. I have a quick breakfast at a gas station store and then head off to the trail to Lock 15 to get the straight goods. I get there and I witness first hand why the canal had been closed. Entire trees were lodged into the lift gate dams and workers were busy removing them. I don't even try to look for the lock master, knowing he's probably busy with this job. I continue on the path past the next lock, since I was told Canajoharie had really high walls and it is vey difficult to put in there. In the town itself, I pass the weird traffic light in the middle of the intersection and checked with tourist information if there was a good place to put in. There is a proper boat ramp, but it is ankle deep in muddy silt from the flood. I chat with some engineers doing some inspection on a new bridge who were intrigued with the convertible rig. I get everything packed int the boat, but end up smearing mud on everything. This part of the Mohawk River valley between Canajoharie and Amsterdam cuts a notch through the foothills of the Adirondack mountains. Without this natural gap, building the Erie canal would not have been possible. With the glacier-gouged Hudson Valley (actually a fjord) already slicing through the Catskills, this route formed the easiest way though the Appalachians and into the vast American interior. The tightest part of the Mohawk valley is defined by two protrusions aptly named Little Nose and Big Nose. Everything is crammed between the Noses: The Mohawk River/Erie Canal, the NY Central railway, the Interstate/Thruway, two state highways and the bike path (an old railway bed). Despite that, from the water the valley still looks relatively lush, and with a stretch of the imagination could still pass for one of the scenes from the Hudson River School of painters. up on a hill advertising a hotel right smack in the centre. I can't find the creek that a local told me was the best place to turn and take out, and I start drifting towards Lock 13, which alarmingly had most of the lift gates in its dam open without much room to manoeuver before risking being swept into the fast current. I nervously stick close to shore and thankfully there is a rocky slope on which to take out just before the lock walls. Lock 13 was a mess, it had caked mud all over it. From the looks of it, the river had flowed right over its lock gates. There was a houseboat moored inside the lock, and the family was just getting back from being evacuated. I chat with them for a bit, and then find a weary old lock master who was due to retire in two days. I pull out the kayak and I borrow a hose to wash off some of the mud on the boat, the bike and me. Happy I was able to paddle through the Noses, I set off for the bike path which had some good long sections of pavement. It was getting dark by the time I approached Amsterdam, made worse by the cloudy skies. The bridge crossing into town seems too busy to take my rig on in the dim light, so I ask a local how to find the sidewalk entrance. The switchback turn on the other side is a big problem, and I have to unhitch the kayak and dismantle the yoke just to get through. Amsterdam NY is one of those faded canal towns. From the looks of its old buildings it was once a bustling place. A huge portion of its population is now of Puerto Rican descent, and I've heard it referred to as "Amsterico". I stop a guy to ask if there was a motel or hotel near by and the gives me instructions how to get to one in a cool distinctive latino accent. Awesome, they let me park the rig under the entrance portico. I shower off the rest of the mud remaining on me and get some Indian food for dinner, at a restaurant coincidentally called Monsoon. It's a cloudy but dry morning. Outside my tent the Mohawk River is still moving fast, evident by speed at which the flotilla of debris drifts by. I go over to the marina office and meet Bernie the harbour master and he makes some calls to find out the status of the canal. Still closed. I go off to find breakfast in a homey place that just opened up, sentimentally called Grandma's Kitchen. The coffee was nice and strong compared to the tea-like brew they seem to serve in diners elsewhere. I get back to the marina to chat with Bernie and he thinks the canal will remain closed for the day, most likely reopening tomorrow. 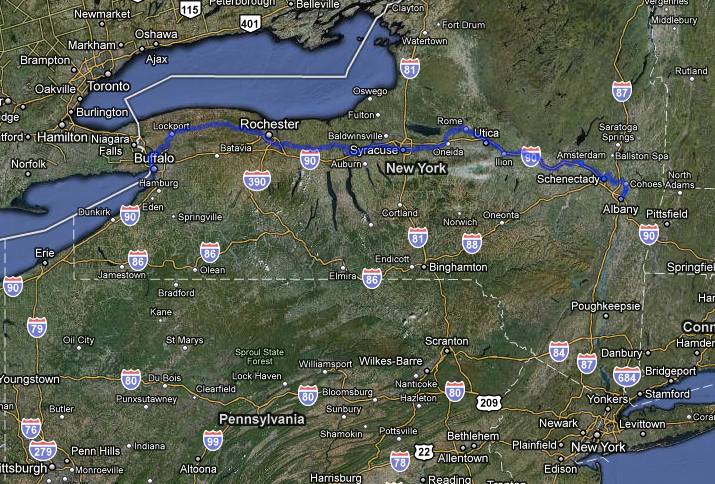 I get an idea that maybe I should change my plans and use this time to go back to Buffalo and get my car. St Johnsville is only about 60 miles form Albany and Bernie says leaving the car here is no problem. Bernie and Bob at the St Johnsville marina. These two just cracked me up with their cutting NY humour. The problem is, is that the train does not stop here, the nearest station is in Amsterdam or Utica. There is a bus that goes to Amsterdam so I pack up some basic stuff -- don't forget the car keys -- and ride into town to see if I can catch the bus. Dang, just missed it and the next one won't get me in time to catch the 1:14 pm train. I go into a gas station store to ask how far Amsterdam is to see if I could ride out there. Thirty some miles, no way would I get there on time either. A man who is in the store, Deri, offers to take me there in his truck for $5 in gas after I tell him about my trip. Deri is a secondhand goods dealer in Little Falls and had spent time in the Philippines as a missionary. He certainly has a lot to talk about during the ride. I tell him I hope I'm not taking him out of his way, and that there is something for him in Amsterdam to make it worthwhile. He replies that he doesn't feel like working today anyway and that this is an interesting enough diversion to his day. Halfway through the ride, I realize I should have asked him to take me to Utica instead. Duh. My bike in the back of Deri's truck. We get to the station five minutes before the train arrives, and the booth is unmanned so there is no way for me to buy a ticket. The train pulls in and I ask one of the conductors if I can get on without a ticket and he says yes but they don't allow bikes. I argue with him that it folds up and can fit in the baggage space and he finally complies. This is the second time I've had a run-in with Amtrak with regards to bikes and I am not impressed. I manage to stuff the bike into a baggage shelf and look for the chief conductor to settle my fare. She tells me that because of the fact I had no ticket or reservation she had to charge me double the normal fare. I said nobody was at the station ticket booth and that I could do it on my cell phone right now, but she tells me bluntly, " Too bad, the train has left the station." Compared to the canal boys, this is the unmoving side of "I'm just doing my job." The train is not even half full, and by the time we pull out of Syracuse it is nearly empty, making me wonder why I paid a premium for not having a reservation. Bikes on trains are such a great inter-modal combination in Europe and a sad missed opportunity in North America. On this route particularly, it could have an amazing symbiotic relationship with the Erie Canal bike route with fantastic marketing potential on both sides. Amtrak only allows bikes on certain trains, and makes it complicated by requiring you to box a partially disassembled bicycle and treat it as checked luggage. In unmanned stations like Amsterdam, it would be difficult. Not to mention the waste of cardboard which you end up throwing away at your destination. Earth to Amtrak: it's not impossible, you're just not trying hard enough. OK, rant over. As the train nears downtown Buffalo, it is so empty I could have danced up and down the aisles naked and nobody would have noticed. With all that space, I unfold the bike. It is so nice to just get off the train, hop on the bike, and I'm within a couple of miles from where I left the car. There it is just like I left it over a week ago. I thank the guard at the gate and get straight on the Thruway, avoiding any temptation to have more chicken wings. I arrive back in St. Johnsville before midnight and crawl into the tent. Due to my own sloth I didn't turn my boat upside down and I discover that the epic rain storm had filled it to overflowing. What a stupid thing to have neglected, and I pay for it by having to pump all the water out. On the plus side I had left out my paddling gloves and they now have a rain-fresh scent instead of the dead rat smell of funky neoprene. Apparently there was at least 4 inches (correction, I heard that 7 inches fell in some places) of rain that fell all at once wreaking havoc to the entire region. As I was eating breakfast at a diner, all the talk in town was about fixing washed out driveways and cleaning up downed trees and flooded basements. I find a spot on the swollen Mohawk River to put in the kayak, near an abandoned section of old canal that had sprung back to life with excess water. The small creeks (or "cricks" as some locals say it) are torrents of brown muddy water, dumping raft loads of twigs, small branches and leaves onto the river. I only get as far as Lock 18 in Jacksonburg when I call the lock master on my cell phone and he says "Sorry, I can't let you through, the canal's been closed due to high water." I am disappointed as this is one of the sections I really wanted to paddle, and the next lock at Little Falls has the highest vertical lift in all the Erie Canal system at 40 feet. I chat with the two lock masters for a bit, trying to find out when the canal might reopen but news from headquarters in Albany is hard to come by. I push off for the trail in light drizzle, looking past the nice rocky shoreline and thinking how nice it would be to be on the water. Past Little Falls, the trail goes on what appears to be an old railway, with deep cuts into the rocky hills. it is nice and flat, but extremely wet and sometimes muddy. Parts of the trail were washed out in the storm, some still had overflowing streams flooding the surface. My wheels are caked in mud, and what started out as a clean rain-washed kayak is now a dirty mess. I stop at Lock 16 to see if there was any updated news on the waterway, and found Tim the lock master puttering about his chores. No news, but he said he would have let me through if I was on the water. After talking to him quite a bit, it's getting late in the day and still drizzling and he tells me of a marina up ahead in St Johnsville. right down to paint swatches and grease specs. At the marina, the Harbour Master has gone home but someone points out a shed where I could pitch my tent out of the rain. Apparently the water level was so high earlier that the boats were practically floating on top of the docks and they laboured all night to keep them away. I am so hungry, I bike out to the local drive-in and have a bowl of clam chowder, a burger, fries and a large chocolate shake and still feel just decently refilled. I take a hot shower, and the shed camping complete with electrical outlet seems downright luxurious. All that is missing is wi-fi. I fall asleep to the pattering of rain on the metal roof. I wake up to rain, lots of it, and the forecast promises that it will get even worse. It has been a week since I started out and probably need a rest day anyway so I decide to stay put. The motel I am in is a real dive, and I talk them into cutting the price of the room by $15 by threatening to move on despite the rain. Of all the places in New York state for me to be grounded for a rainy day, it had to be Ilion. The big thing in town is the Remington gun factory which is so not my cup of tea. Other than that there's the Rite-Aid Pharmacy (for when you shoot yourself in the foot), and the McDonald's (for when you are unsuccessful at shooting something for dinner). On my way to breakfast with the Hamburglar and Grimace (if there was anywhere where they would still exist it would be here) I pass by men in their Sunday undershirt best smoking cigarettes and drinking beer on a balcony at 9 am. I feel like I am trapped in a John Cougar Mellencamp song. OK, so maybe the rain is making me cynical. The rain does get heavier, and by noon it is torrential. I spend the afternoon holed up in the motel room, taking advantage of the wi-fi to post a couple days worth of ramblings that have languished in my netbook, and editing some of the older posts. It has been fun doing this, though, and knowing you're going to go public with writing about your day encourages you to actively seek something interesting or take more intriguing photos as you go. It's a creative writing exercise, and the way I've approached it is I take notes, written or mental, throughout the day and in the evening I try and weave it into a thematic anecdote. It's like one of those cooking shows where the chefs open up a hamper of disparate ingredients and try to concoct a palatable dish out of it all.